Contact Usarrive in early June and generally stay till late October, with August- October being the hottest months. These are extremely powerful, fast and probably the toughest fighting fish in the Atlantic! Bluefin are also one of the most elusive gamefish in the ocean, but they must also eat 1/3 of their body weight a day in order to maintain their current weight. This means they will eat when the right bait is rigged and presented correctly. 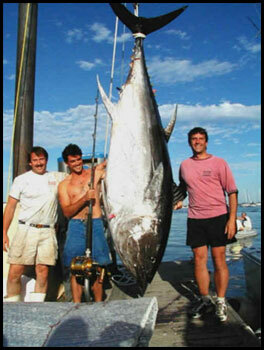 Captain Doug Anderson has been fishing these giants for many years and has won and placed in many Giant Tuna tournaments. Fish with us and you have a very good chance of hooking one of these monsters. We use all Shimano Tiagra 130 Class reels with custom rods. 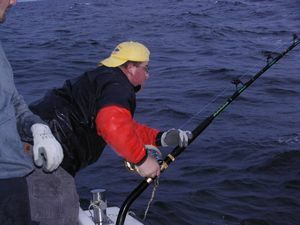 On our tuna trips you will be involved in all aspects of catching a Bluefin, from setting our nets, to catching live bait, to rigging the rods and fighting the fish. 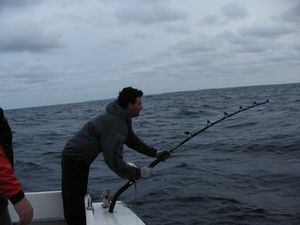 There is no bigger thrill than hooking a Giant Bluefin !